Wood Mallets has earned a reputation worldwide for the superb craftsmanship of its croquet mallets. Each croquet mallet is made to the highest possible standard using the best materials by craftsmen who are proud of their workmanship. Whether for the international croquet champion or the backyard player, our equipment is made to look great and to perform well. 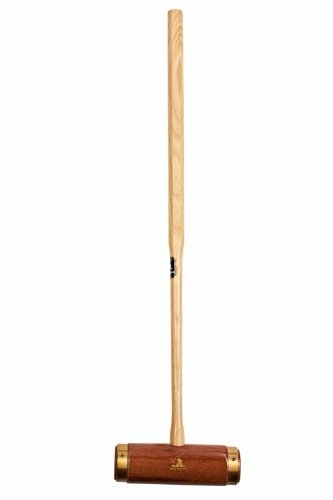 The Wood Mallets Hurlingham Croquet Mallet is our top-of-the-line home- and garden-style mallet, exceeded only by The Original Mallet or a custom-made Wood Mallets croquet mallet. The Hurlingham Croquet Mallet is engineered to international standards and made from the finest materials. Those experienced in the intricacies of croquet will agree that it's a serious game, which demands precise equipment. The head is made from sustainably-managed quila hardwood sourced from a certified supplier, are turned to a tradition cylindrical shape and have an inlaid sighting line. The brass rings are heated before being pressed over the ends and screwed firmly in place. Not only does the polished brass look great, but it eliminates the chances of splitting the edges of mallet head from off-center shots. Selected tankoak is used for the mallet handles. This timber has proven its resilience and the tests of time. The lower half of the handle is turned on a copy lathe and the top half is shaped to a positive octagonal shape as used for the competition mallets. Our distinctive Wood Mallets gold crest is stamped on one side of the mallet head and the overall mallet weight stamped on the handle. Each mallet then receives no less than four spray coats of epoxy urethane with sanding in between coats to create a high luster and a hard-wearing finish.